Juwan Morgan poured in 31 points and grabbed 10 rebounds. Morgan was wildly efficient from all over the court, finishing 13 of 18, including 5 of 7 from 3-point range. Romeo Langford added 20 points. For more than 34 minutes, the Aggies held the lead, pushing the advantage to as many as 14 points. 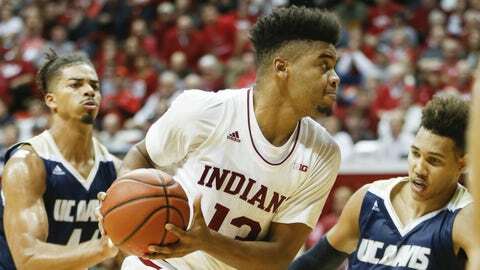 After cutting the deficit to six points, Indiana went on a 14-0 run that flipped it to an eight-point lead the Hoosiers never surrendered. Over the final 8:27, they outscored the Aggies 28-8. TJ Shorts III had 16 points and seven assists for UC-Davis.